You can teach kids to cook! Here’s how! I didn’t learn how to cook until well into my 20s. To this day, 11 years into married and domestic life, I have yet to take a cooking class. I’ve learned how to cook the hard way–muddling through cookbooks and recipes, setting off the fire alarm and smoking up the kitchen, failing more times than succeeding. I want something else for my girls. 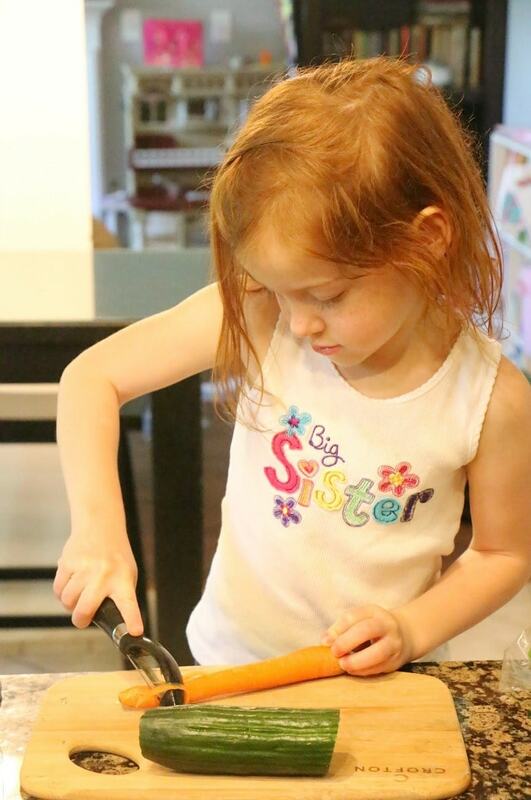 As the mom of three “little women,” I desire for them to learn how to cook from an early age. I also know that learning to cook will help them to eat healthy! I know it won’t always be fun. It won’t always be easy. And it most certainly will be messy. But it will be worth it. At 3, 5, and 7, my girls are already super curious about what all goes on in the kitchen. 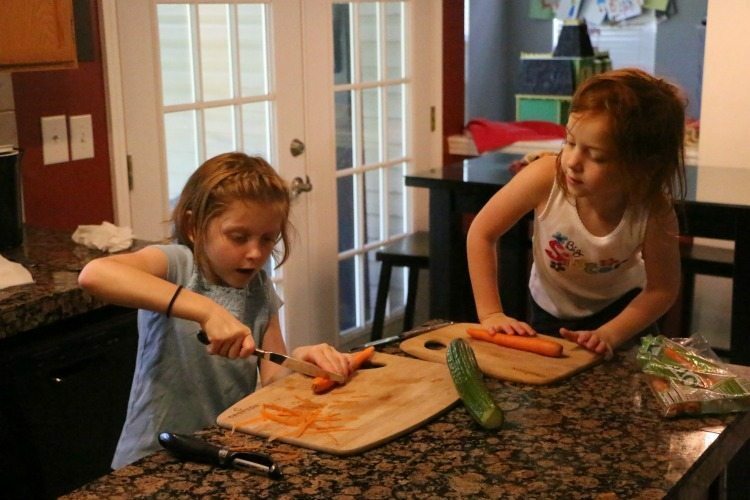 Although they join me in the kitchen year-round as time permits, we most definitely have more margin in our lives for cooking lessons during the summer months. I want them to learn the right way–not through the misshaped trial-and-error fashion in which I taught myself how to cook. Here are 3 ways you can teach kids to cook. 1. Start with the simple. I have no aspirations for my girls to make our family a 4-course meal after a few days of cooking lessons. But, realistically, they will be able to learn simple things like how to butter bread, peel veggies, and scramble eggs. These simple lessons in which we will start will become the building blocks for more intense cooking later. Our kitchen will get messy. 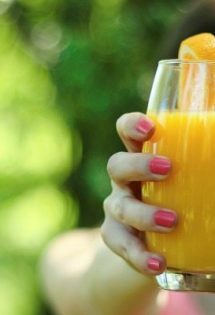 They will not hold knives or peelers or any other utensils correctly the first time. They will, most likely, make many mistakes at first. My job is not to criticize them but to remember that they are just children, and all of these mistakes will add up to successes if I exercise patience with my little ones. I cannot expect to know how to do everything the first time or even the first couple of times. I must instruct them in the proper way to do these things. 3. Take cooking classes, together. Many community recreation centers or even local colleges offer cooking classes for the whole family. Some–but not all–of these come with a hefty price tag, to the tune of anywhere from $7-$35 per hour! Instead of an in-person class, our family has opted to take my dear friend Katie Kimball’s Kids Cook Real Food eCourse. We actually began the class with our girls over the summer, and they loved the lessons on buttering bread and peeling veggies. They couldn’t wait to get in the kitchen and practice their newfound skills! Kids Cook Real Food is open right now, and you can start it anytime you want to. Some of the lessons and skills are simple enough that your kids can get in the kitchen with you quickly. Everyone who signs up for Kids Cook Real Food get 12-months access, and those who sign up for the VIP class get lifelong access, but I believe now is the perfect time to start it. I don’t know about you, but my girls will get stir crazy during the holiday breaks, and this can keep them occupied (and help me get Thanksgiving and Christmas meals on the table!). 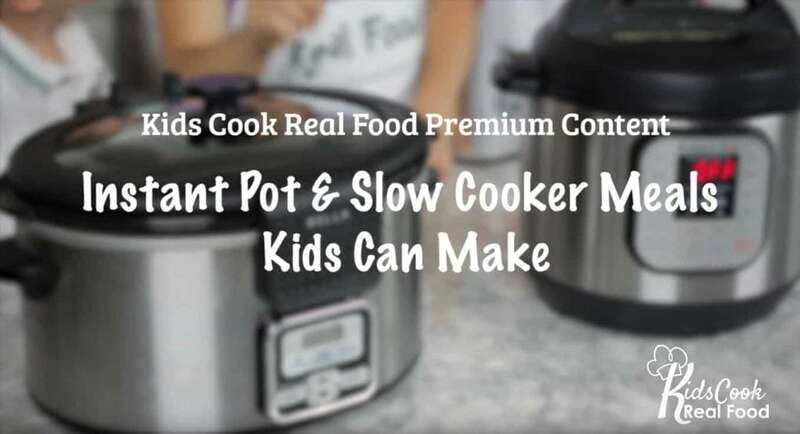 Katie has newly released her Instant Pot and Slow cooker recipes that kids can make as a stand alone series. It’s amazing to watch the kids pretty much make dinner on their own. Katie is also offering a FREE resource for 10 healthy snacks that your kids can make on their own. You can view the entire curriculum map here. Based on their ages, my girls could be in the beginning, intermediate, and advanced classes, but I am opting to start all three out together in the beginning class. We will all move up together. What about the class teacher? I’ve met Katie in person twice (spending a week with her each time! ), and she’s the real deal. You can almost see “teacher” oozing out of her. We were together with seven blogging families for an entire week per visit, and there were over 20 kids running around! She knew all their names after one day, because they were important to her. 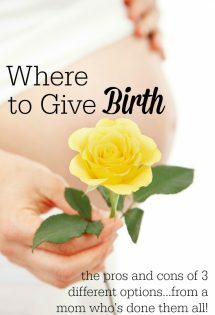 She’ll also ask any kid nearby to help out if something needs to be done – and expect them to do it, too! Teaching responsibility just comes naturally to her. This girl lives it – it’s totally a calling. Her oldest, Paul, pitched in by making guacamole for lunch and helped with breakfast meals as well. My middle daughter and Katie’s John are about the same age and got along famously. Katie told me later that John said, “I like her because she said yes when I asked if anyone wanted to play football with me.” The cuteness of a 5-year-old! His sweet little personality really comes through in the eCourse, too, and I hear a lot of other parents are saying that their kids enjoy the videos so much that they talk about John like he’s their friend, too! Not sure if you want to join the whole course? You can always sign up for her FREE mini eCourse–a knife skills class for kids! Sign up for that one here. 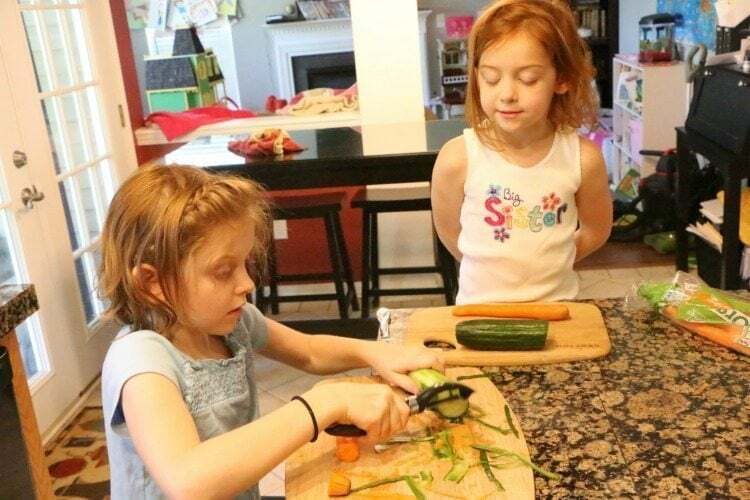 Want to take Kids Cook Real Food with your children? Sign up here! 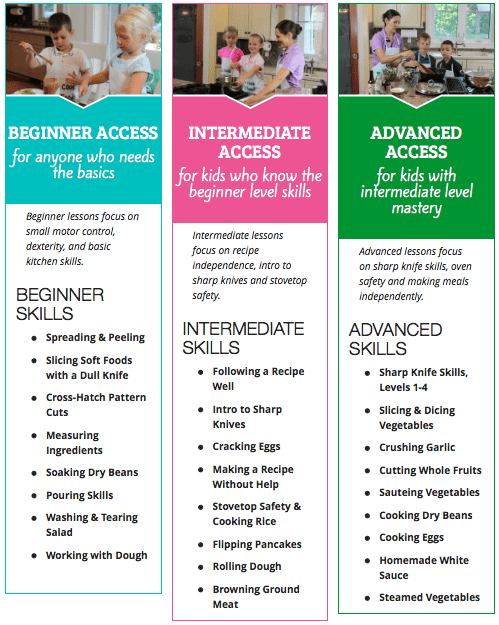 Have you taught your kids how to cook yet? What are your tips for how to teach kids to cook? How did you learn how to cook? Share in the comments! I never really learned to cook either and I cook A LOT now (eating out is expensive!) This post is such a good reminder to have my kids in the kitchen with me. It takes extra time but is so valuable in teaching them a basic life skill. Eating out IS expensive–another reason why teaching our kids is so important (it will save the budget later!). What a great point!! I totally understand!! That is my issue too!! I’m trying really hard to let it happen, but I feel your hesitations! I love that your mom and grandma taught you how to cook! I let my kids help me cook. They’ve been helping me for a long time. It is such an important skill. I let them make their own breakfast and lunch on their own. It is very helpful, because they know how to put together a healthy meal. I love that you do this, Keelie! You inspire me! I love that you teach your sons these skills: Their wives will love you for it!